Mr. Adnan Khashoggi, the one time worlds richest businessman in the early 70s, along with having the most powerful name to have in world business for the past 5 decades has died. He died due to a combination of Parkinson’s and heart issues on June 6, 2017, he was 81. “AK” as he was known to his close confidants, was born in Mecca, Saudi Arabia on July 25, 1935. As a kid, his father was the personal doctor of the King of Saudi Arabia right from the start. This familial structure was perhaps the beginning ‘subliminal undertone’ for what was to come for AK as he got older as he lived his life and flourished so incredibly. Then by the time the 1970’s arrived, was when my own father came into contact with Khashoggi through his own personal boss and confidant, John M Shaheen, a Lebanese financier and eventual close family friend. 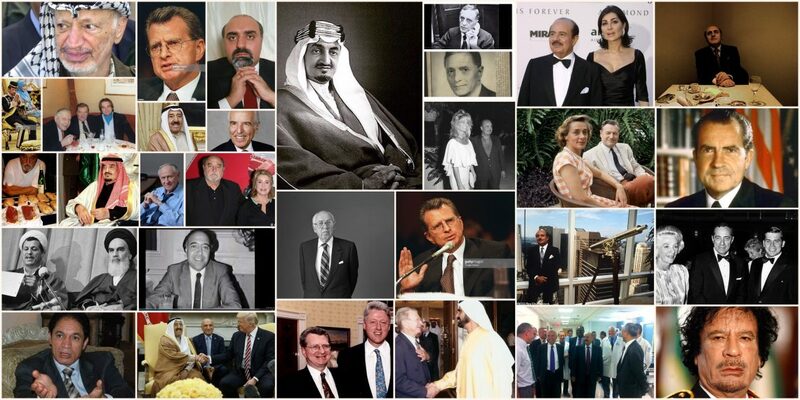 It was through my father’s working for Shaheen’s “Come by chance/Ring Free Oil Company”, during those earlier years of the 70s, that Dad eventually met all the future political figures of American history; William Casey, Richard Nixon etc… And then of course the biggest International Political Figure of the World, Adnan Khashoggi, also stepped into view of my father’s life as well around the same time again, all thanks to Shaheen as well. In the mid 70s, my father became even closer with “AK”. Although, ever since their first meeting, AK was impressed with this ‘Vice-President’ for Shaheen. It turned out they did ‘hit it off’ and it wasn’t until later on that AK asked Dad to team up with him ‘on the side’ as he was working with Shaheen still, thus what eventually made the extremely close knit connection, between AK and my father, Roy later on down the road. The one thing that really stands out from our history of being personally connected with AK and from when my own father was alive as we often would talk about Khashoggi, was the fact that my Dad always said this about AK: “Once you team up with AK and do a deal with him, you have a business partner for life, and AK treasures loyalty”. This was most certainly my father’s belief. And this was absolutely Khashoggi’s way of doing business, even more so. Then when I think back to a personal tragedy where I almost lost my Mom to a Viral Encephalitis Attack in 1981, I do remember Mr. Khashoggi often asking how Mom was doing. He always made sure to ask about family. Some 7 months after my mom’s attack, when my sister Kari Andrea died on December 14, 1981 at the age of 16 from Mono and Hepatitis, I vaguely remember Mr. Khashoggi, asking how Dad was doing on the phone. After all, it is known that Khashoggi’s own daughter had some issues herself, where she almost committed suicide, so thankfully, this did not occur to Khashoggi’s daughter Nabila, but AK was able to realize the seriousness of our own personal tragedy. This was him. A softy. A Genuine human being. Then by the time the American Political Scandal; The Iran Arms Deal of the late 1980s arrived, with President Ronald Reagan trading weapons for freedom of hostages came into view, both my father and AK were mixed in with this fiasco. In brief, Dad was AK’s ‘go-between’ and or perhaps another laymen’s term one could use could be; “secretary like/ close confidant’ etc… When it was learned that Khashoggi lost $10 Million of his own personal money within the deal, AK sent my Dad in to meet with the CIA Director then, William J Casey. Of course to do such thing, was something my Dad had never done. Yes, indeed Dad was nervous, for he had never gone into that part of Virginia, where the CIA Headquarters was located, but he did and he met with Casey and gave AK’s message to Casey for him. Sadly for Khashoggi, he never did get his money returned to him, thanks to Oliver North. I remember my Dad did a lot for AK during those ‘Iran Contra’ years when the Iran Arms Deal was quite popular. I remember another family friend having nothing to do with any of this political stuff, felt that AK should’ve paid my Dad more than what he actually got for all he did, but on the same hand I always remember dad saying something to the effect of; “hey, even if I didn’t get anything more, whatever I could do to help, I would always do for Khashoggi”. Then by the time 1988 arrived, Khashoggi had some legal troubles himself. Mr. Khashoggi was arrested in Switzerland accused with hiding funds and possible racketeering charges along side with Imelda Marcos. Eventually, Khashoggi stopped fighting the extradition when the U.S Govt lowered their charges. Khashoggi then was willing to live in NYC for that following summer, and make his case. I will always remember how Khashoggi said that “In America, the political scandals are like Hollywood movies. So extravagant, with tons of press, a beginning, a middle and an end. And in turn, making things bigger than, they really were”. The other little input story I remember my father sharing was, that a business person, someone else other than Khashoggi, told Dad to get a lawyer, cause he was maybe involved with this Marcos/Khashoggi thing. Dad’s face dropped in panic. Apparently, during their investigation to all this, Dad’s phone number showed up as calling Imelda Marcos. I will never forget Dad saying; ‘impossible’! “I don’t even know her”! Well, in the end, Dad later learned that it was some other business associate of Dad’s who was in Dad’s office, who did in fact call Imelda Marcos without Dad’s knowledge. The idea of true loyalty between my father Roy and Khashoggi, came when my own father had a legal issue with the Federal Government of the United States of America. Back in June 1988, my father was arrested on the streets of Manhattan during a bright sunny afternoon, as an illegal U.S. Govt ‘Sting operation’ was now taking place. This case had to do with the U.S Govt attaining illegal documents that they acquired somehow, and then ‘set up my dad’, to entrap him. The scheme was for the undercover agents to hand them to Dad, as if Dad knew they were ‘stolen’. But of course, he/Dad had no clue they were. In fact, my father actually attempted to send another sibling of mine to pick them up, since the undercover agent who called dad at home telling them to ‘come meet and pick them up to give to someone else”, and dad was actually too busy to do this. So, when my dad offered his older son to come to pick them up, the agents (at that time, no one knew they were undercover agents..) panicked and said; “no, no,no – we want YOU to come down and get them”! So, Dad eventually did. Sadly, that was a huge error. In the end, this was known as the “Ashland Oil Case”, pertaining to stolen documents to help out an Iranian Oil Company – but the reason why I bring this up, is due to a very important part of this evil scheme from the U.S Government. There was once a time where my father tape recorded the phone call between himself and the Immigration Agent/FBI and the agent at one point said to Dad: “Don’t worry, we would never ask you to go undercover for us, to get Khashoggi in the future. We know you two have a close relationship”. Well, I can certainly say, I remember and quite well, seeing for myself how my father often would react about all the ‘what ifs’ . Meaning: What if, the U.S Govt wanted Dad to ‘help the govt’ to arrest Khashoggi for something? Well, the answer to that, was quick and simple. My father always said, with no hesitation ever: “Never! I would NEVER be a part of anything like this ever. I’d go to Jail or refuse, if I had to, then to turn on AK”! Thus, loyalty for the laymen, is easy to see here. You couldn’t get any other person that willing to defend such a powerful character as my father. I still find that truly amazing, the amount of support they both gave each other in a wide variety of ways. My father has been dead now for 16 years, so I’m unable to just go up and ask Dad about things. 😦 What little I do remember, that Dad over all those decades of his working with AK, did get paid a lot, and most often it was a combination of cash, or bank wire transfer. Less we ‘not’ forget; AK and my Dad had a very unique friendship. If AK needed Dad for help for some deal, AK would either pay him his airfare ticket to get to some place, or give him extra couple grand in cash in person as a ‘thank you’, or bank wire transfer etc.. And yes, this is how my Dad made a living. One of the best personal memories I have is pertaining to my graduation of high-school at the prep school, Northfield Mount Hermon School, in Northfield, Massachusetts. It was June 1987, my Graduation Day, and Dad pulled me aside and walked up to me and said; “You almost did not graduate. I didn’t have the funds, things were tough. Thankfully, AK paid for your final year”. I will never forget the panic feeling I had felt, about how close I was to not graduating. Granted. This is something that is way outside of the ‘norm’ and well we were all aware of this fact. We never did take things for granted ever, despite having one of the richest men in the world be a close friend of our Dad! We were always appreciative and well, again, this all shows the ‘giving side’ of Khashoggi’s way of doing things. Meaning, he, himself, Khashoggi, was the one with the ‘open heart’ to others. If he could help, depending on whatever situation was at hand, he would if he could. And in our case, he did! Yes, we were lucky. Another one of my favorite personal stories about AK was in June 1988. I remember coming back home to Brooklyn Heights, New York after living a year in Hawaii. Dad informed me before I arrived home, that AK had invited us to his glitzy home in Marbella, Spain for one of his son’s 21st Birthday party I think it was. And we were told that Prince and Michael Jackson, were the private entertainers for this huge bash. Dad informed me that AK offered to pay for our Airfare to fly from JFK in NYC to Spain. As well as to pay for me to buy my own tuxedo, since I never had such a thing for myself. Of course I wanted to go, and we were planning to go, but some medical things came up for me, and sadly I was not able to make it. However, this was one more memory I will always have about Khashoggi. Just the idea that I had this invitation, from someone so prestigious, yet close to our family at the same time. Michael Jackson, was the other Entertainer for the Private party at Khashoggi’s in Marbella, Spain. I was quite sad, that I was not able to go. I would love to have met both him and Prince. Then I remember while our family was living in Vermont, after we had moved out of Brooklyn Heights, New York, there was once a time where AK got me a job to work at a restaurant within the kitchen I forget the name of the place, but it was a Restaurant in the German section of Switzerland. Now, considering this time, I was quite young myself; that my desire to live and work in Europe at that time was not as strong as it is today. I will never forget when Dad said to me: “If you take it – you can’t quit! This is Khashoggi! Khashoggi got you the job, you can’t quit”! I know my Dad didn’t mean to place so much pressure on me, and I know he meant well, but in the end, it was due to the pressure, that I then declined. Plus, i didn’t know any German, and well, it was for the best. Then in May 1991, my handicap Mom and I went down to Boston, Massachusetts with Dad so he could meet with AK for a meeting. He told me to stay with Mom in our hotel room as he had his meeting, and then he would call me to come down and join them once their meeting was done. Eventually, that phone rang and Dad said to come on down. My Memories of Mr. Adnan M Khashoggi, will always be good and happy memories. From the ‘once in blue moon’ phone calls from him, to wish us Happy Holidays during Christmas, or the few Holiday Cards we received from him, or the times he called when we had personal family tragedies ourselves. I had always hoped to have another chance to spend time with AK, even after the passing of my father, Roy. Sadly, it never did happen. During my travels from 2003-2010, I tried and I tried to spend time with him, and meet up with him, but something my father so often informed me about, that AK was very hard to connect with, whether he was in one place and I in another – THAT was the way it was, with Adnan. Here is a secret about Khashoggi. During the Reagan Administration of the Iran Arms Deal, my father and AK and other family friend, Manucher Ghorbanifar all had ‘code names’. So anytime they were talking on the phone, they never used their real names. AK’s code name was: “The Eagle”. Dad’s code name was: “Mr. Roy”. Ghorbanifar’s code name was: “The Beard”. Well, Mr. Khashoggi….now that you have passed, I am still sadden to hear of your death. I still wish I could have had more opportunity to spend with you, perhaps work along side with you as well. I thank you for helping me to graduate from high-school, and I still am flattered that you were so nice to invite me to Marbella, Spain for your celebration for your son. And most of all, I am very grateful for the close, loyal friendship you and my father had for all those years. You were very important to us back then, and you will always be important to us, as we remember you and your memory. Hope you have connected with Dad by now…..